The promise to hold one another in love, we have 19. March 2010, at 9.30 clock, made in the Caroline-Mathilde-wedding room of the residential palace of Celle. "... A great love does not need many words - WE HAVE MARRIED!" 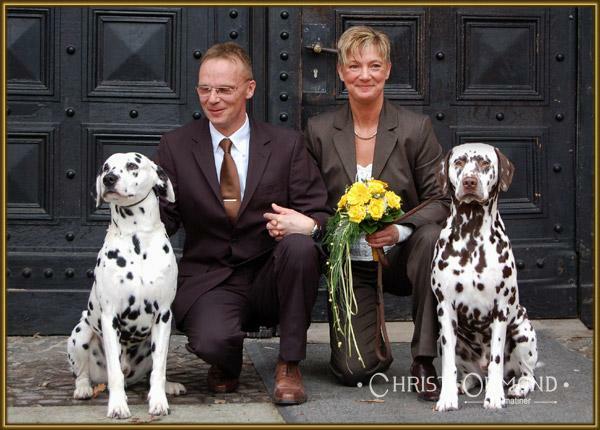 We are very happy that our closest relatives, our esteemed veterinarian, my two favorite work colleagues and about 40 of our closest Dalmatian friends, there are breeders, exhibitors, stud owner and Dalmatian lovers, are followed without exception our invitation, and sometimes very long arrivals have taken upon themselves to jointly spend with us our special day. Photo: Our good luck charm "Porter" with the bride and groom "Michael & Karola Lehmann and "Coppola"
After our beautiful wedding ceremony we were all in Landgasthaus Heidehof expected Ahnsbeck where we could be together this day for a delicious lunch, a cozy coffee drinking and merry get-together afterwards to our best recollection. We thank all our guests with all my heart for this wonderful day! Here are some photo impressions (gallery). Please click on the photo. We spent three exceptionally beautiful Honeymoon in Hamburg in bright sunshine. Our Hotel "Alster Hof" was right on the Alster lake and a huge park, just 5 minutes from the beautiful Alex Café and close to the Congress Centre, where we really commendable performance in the evening the "Thriller-Live" with bang-up mood viewed. On our Honeymoon we have our future bride and groom "Latoya vom Teutoburger Wald" (called Latoya) with her future husband "Christi ORMOND Exquisite Selection" (called Silas) accompanied as Latoya had already come into the heat and possibly the pairing of our "dream pair" on our honeymoon would take place.